You’ve written some blog articles and some have succeeded in increasing traffic, but most haven’t. What’s your next step? It’s easy to say, “Well, I will just replicate whatever brought me the most traffic.” But sheer number of visits is not necessarily the best way to measure blog success. You want to measure it by the quality of visits. This isn’t another article about the quality of leads, but rather, an article about what your traffic data can tell you about the visitors you are attracting. You should base your blogging strategy around the traffic you want to attract. So last month, my agency finally practiced what it preaches to many of its clients, blogging at least twice a week. Compared to the previous month, the results from November were pretty impressive as far as traffic increase goes. We had blogged five times in October and twice amount that in November. What’s interesting to note here is that our blogging in November covered a wide range of topics. Although we generated more traffic, at the end of the day we attracted more visitors. We acquired one contact in October and one contact in November from blogging alone, but we did something strategically different in October; we re-purposed two of our blog articles into webinars, which acquired 20 leads for that month. We did half the amount of blogging in October, yet increased our contact rate by 95 percent due to our webinars. Attracting traffic is important, but we only generated one lead from our blogs in November and October. The difference is that, in October, we created webinars to go along with two of our blog posts. We sent out an email blast to our existing contacts and provided a CTA link on a couple of articles that were relevant to the topic that the webinar was promoting. These posts were more specifically targeted toward decision makers who had to convince themselves or others of the value of inbound through ROI. The results we got from repurposing these two pieces of content into webinars not only increased our traffic, but we also acquired 20 new leads. So what did we learn from our blogging data? We learned that when blog articles are paired with webinars, they are more effective at bringing in a specific crowd of visitors who are more interested or qualified in hearing what you have to say. We also saw that, regardless of what you did with blog content, just having more blog content brings in more traffic. But, we now know that it is more effective to re-purpose a blog post into another piece of content. Take advantage of this interaction and use your webinar to engage your visitors with questions about their opinions or real life examples; you can learn a lot about your audience this way. When you write a blog post, you are a casting a very wide net at into an even larger ocean. 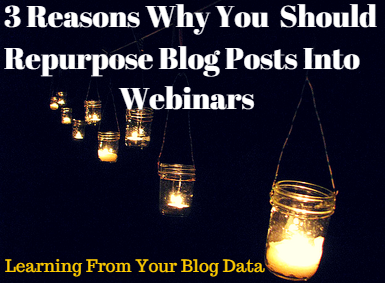 When you re-purpose that blog post into a webinar, the visitors that engage with that webinar are more qualified as leads right off the bat since they are choosing to interact with that content. Although not every visitor is necessarily going to be considered a qualified lead that attends your webinar, you at least know that they are more serious than your average subscriber. This means that marketing automation that can capture lead engagement is crucial in knowing the audience that your blog or webinar is attracting.